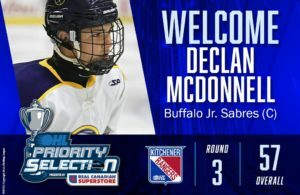 Another Western New York hockey prospects is on his way to the OHL as Dylan Seitz committed to an Ontario Hockey League standar player agreement Kitchener Rangers this past summer. 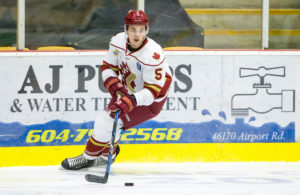 Seitz, a 15th round pick in the 2015 OHL Priority Selection will have some help easing the transition to the OHL in veteran defenseman Frank Hora, a native of Cheektowaga. Seitz, a 6-foot-1, 175 pound forward from Eden, NY has been on scouts radar for awhile now and was a participant at the USA Hockey Select 15, Select 16 & Select 17 camps over the last three summers. A former member of the Nichols School Vikings Prep A team, Seitz spent last season with the Buffalo Jr. Sabres of the tallying 13 goals and 16 assists for 29 points over 55 games. Despite being the youngest member of the Jr. Sabres last season, Dylan clearly was not out of place and put up impressive numbers as a rookie, earning him a spot with the Rangers this season.